Roma. Just that one word conjures up a million images. The Capital of Italy. The Eternal City. The City of Love. The City of Seven Hills. 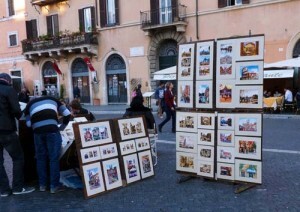 An ancient City brimming with extraordinary art, sculpture and architecture. The centre of the Roman Catholic faith and home of the Pope. 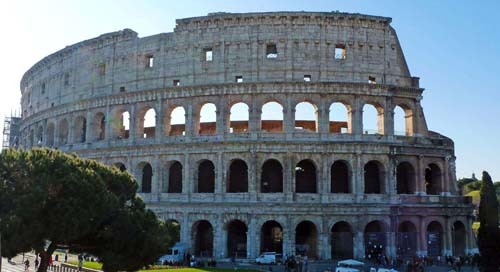 Founded in 753 BC on the banks of the Tiber River, Rome captures over 3,000 years of history. It is a huge undertaking to explore Rome in just three days. “Rome Walks” made the task much easier. Their knowledgeable local guides enabled us to have a unique experience. First of all, we explored the Vatican, the Sistine Chapel and St. Peter’s Basilica with Maria-Rosaria. The following day we toured the Ancient City, the Colosseum, the Roman Forum and Palatine Hill with Andrea. Lastly Paul guided our twilight stroll from the Campo de’ Fiori, through the Piazza Navona, past the Pantheon and Trevi Fountain to the Spanish Steps. We made our way across the silt-laden Tiber to arrive at “Rome Walks” pre-determined meeting place for our first walk. It was a Wednesday and crowds of people were jammed into the Piazza San Pietro, St. Peter’s Basilica Square, to receive the Pope’s weekly blessing. We spent a few moments absorbing the atmosphere. Construction of the Basilica started in the 1500s, involved the work of 12 architects and was not completed until over 100 years later. We marvelled at the Renaissance architecture, the imposing dome, the colonnades, the central obelisk and the giant-sized statues. As soon as all 10 guests had arrived, our guide led us through the Vatican Museum. It was an eye-opening experience. 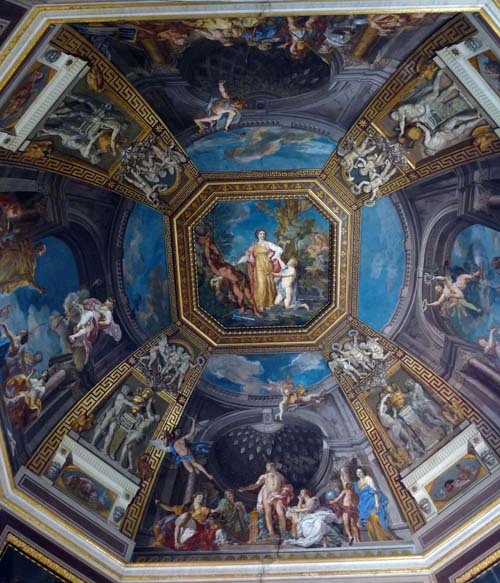 We passed vivid frescoes depicting religious scenes, intricate tapestries, marble floors, classical statues, detailed maps of the world and masterpieces by Rafael and Da Vinci. It took Pope Julius II two years to persuade Michelangelo, Italy’s renowned sculptor, to paint a new ceiling in the Sistine Chapel. Already in his 60s, he had never before created a fresco. Such was its complexity that he locked himself in the chapel to ensure complete solitude. In 1512, 4½ years later, he completed the project. The result is the masterpiece that we marvel at today. Next our group entered St. Peter’s Basilica. We found its sheer size and elaborate splendour overpowering. Until recently, it could claim to be the biggest church in the world. The Basilica can accommodate up to 60,000 people. It houses a trove of priceless treasures in marble and bronze carved by some of the world’s greatest sculptors of the time. Just beyond the entrance is Michelangelo’s Pieta lovingly created from Carrera marble. His amazing talent rendered this unforgiving material to resemble the soft folds of drapery. At 24 years’ old this was his first masterpiece. Standing beneath the dome, we felt dwarfed by the enormous sculpted bronze canopy over Bernini’s Papal Altar, the Basilica’s central feature. There are innumerable outstanding works of art on the walls and the altars. These have been created using not paint but thousands of tiny coloured pieces of mosaic. We were in awe of the dedicated workmanship that makes up the Basilica’s interior. Of course, one has to see the view from the dome. An elevator ride brought us to an interior gallery. Here, in gigantic letters, was the biblical inscription “You are Peter, and on this rock I will build my church …” We looked down almost 145 ft. to observe the seemingly miniature people on the floor of the Basilica. Then we climbed up the narrow spiraling stairway to the outdoor viewing platform. Sightseers jostled shoulder-to-shoulder. At last we managed to edge our way to the railing. 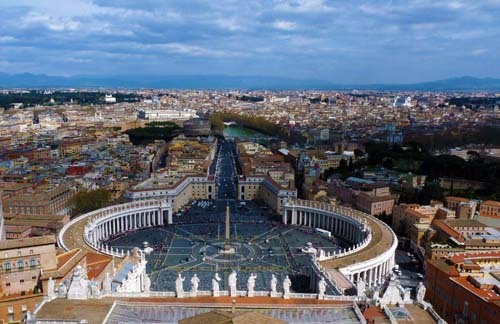 Spread below us was a panoramic view of St. Peter’s Square, the Vatican City and the rooftops of Rome. The next day Andrea introduced us to Rome’s famous Colosseum. This amazing four-storey building constructed of blocks of travertine marble was constructed between 69 and 81 AD. Even without today’s technology, the builders of ancient Rome were able to make this edifice earthquake-proof. Its huge amphitheatre could accommodate 65-70,000 people and, in case of fire, could be emptied in 7-8 minutes. There were 80 arches on each of the lower three concentric floors. On the ground floor, four special archways were reserved for entry by the emperor and certain celebrities. The animals and gladiators were kept below ground. In its heyday, there was no entry fee and the citizens in attendance received free food courtesy of the Emperor or other financier. The day’s schedule was full. It started around 8 am with displays of exotic animals followed by theatrical plays, public executions and gladiator fights and finally supper. We followed Andrea to the 16th century arch at the entrance to Palatine Hill, one of the seven hills of Rome. The small village that existed on this site a thousand years ago would eventually become the City of Rome. Several emperors built palaces and resided here during the Roman Empire (27-476 AD). Andrea pointed out that the monastery on the hillside was built in the Middle Ages. Under azure blue skies, the scene made a pretty picture. It was flanked by pink cherry blossoms and silhouetted against the skyline were the rounded tops of Mediterranean umbrella pines. We ambled over the Roman road’s ancient stone slabs gazing this way and that. Nearby was the Circus Maximus, a monumental garden once used for exercising horses. Over yonder was the Temple of Romulo which still retains its original bronze door. Further on we passed the three remaining columns of the Temple of Castor and Pollux built to commemorate a successful military campaign, the well-preserved Temple of Antoninus which was transformed into a church around the 7th century and the circular House of the Vestal Virgins with an exit for holy smoke to reach the sky. At last we came to the historically important Roman Forum, originally a marketplace. It was once the heart of Roman public life … the bustling centre from which Rome ruled the civilized world for over 500 years. On the darker side, some claim it was the site of the death of Julius Caesar on the Ides of March in 44 BC. It was a fascinating journey through history. We were treading in the footsteps of Roman senators, free citizens, slaves and politicians of the 2nd century. Dressed in the standard Roman tunica or toga of the day, our group could have blended seamlessly with the crowds. On our last evening in Rome, we enjoyed a two-hour guided twilight walk. We met our guide Paul, a professor of history, around six o’clock. 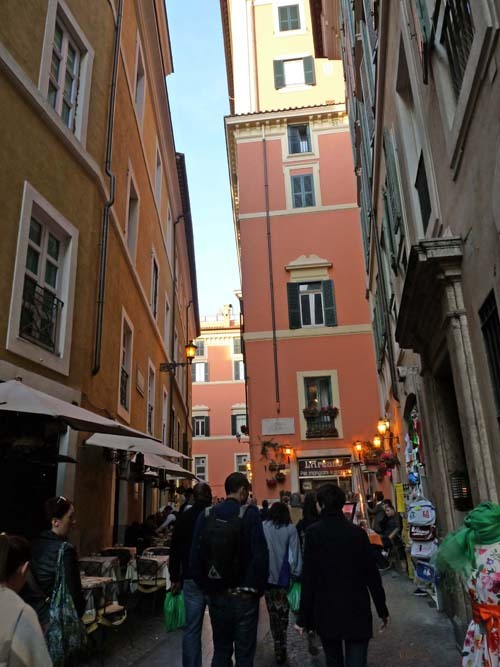 We strolled a few steps together to the lively Campo de’ Fiori, Field of Flowers, where we looked up at the towering statue of the hooded Giordano Bruno, an intellectual heretic. 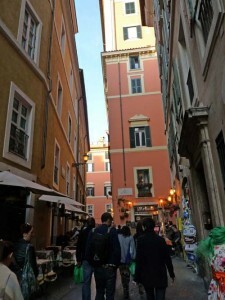 Following Paul we crossed a main street and continued along a narrow passageway to the long oval Piazza Navona. Surrounded by Baroque palaces, this pedestrian-only square becomes a hive of activity as evening descends. 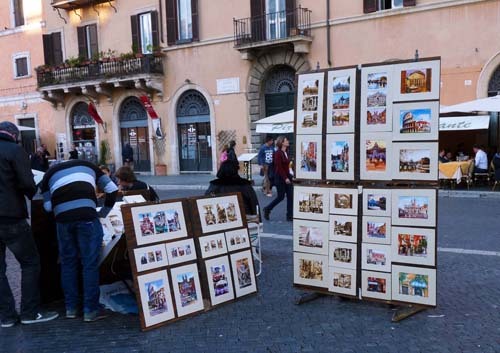 Local artists were setting up their wares, aspiring musicians filled the air with music, tourists and locals alike gathered at the open-air cafes, vendors touted their wares and from the Fontana dei Quattro Fiumi, Four Rivers Fountain came the soothing sound of splashing water. 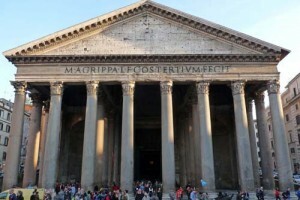 Our next stop was at the Pantheon, one of the best preserved buildings of its era. A circular building it is fronted by 13 large granite columns and is topped by a central dome. At its apex is an oculus which provides the interior’s only light source and also channels rainwater to an underground drainage system. 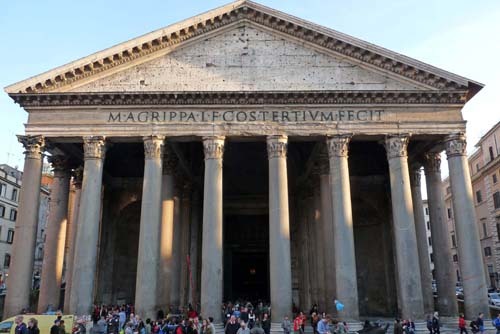 The Pantheon has been in continuous use since its dedication as a Roman temple around 115 AD. If only designers of our age were as resourceful as those talented Roman architects. 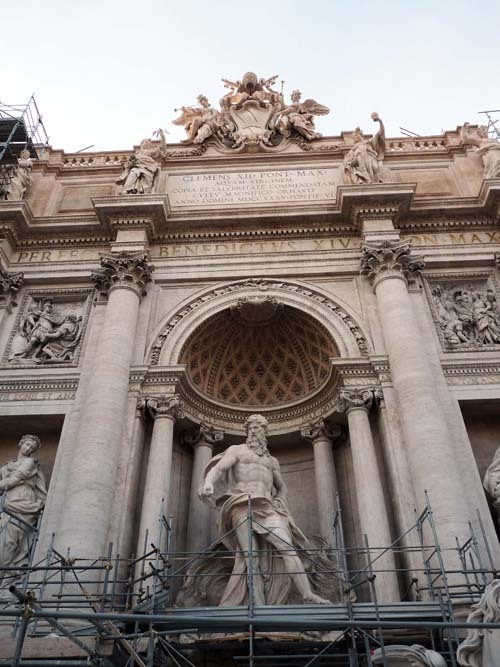 We continued onwards until we reached the world-famous Trevi Fountain once the city’s source of fresh water. It is huge … 20 meters wide and 26 meters high. Its construction took 30 years. It wasn’t until 1743 that water first baptized the fountain. Unfortunately, during our visit, there was barely a trickle as this majestic structure was undergoing a major renovation and much of its beauty was hidden behind a maze of scaffolding. Under normal circumstances, the daily flow of water is some 80 million litres. Not to be outdone and true to tradition we each threw a coin into a small pool in the hope that one day we would return to Rome. By this time, our feet were flagging. Paul was adamant that there was still one more famous landmark we had to see, the Scalinata di Spagna or Spanish Steps. Built in the 1720s, this wide sweeping stairway gracefully climbs a steep slope connecting two piazzas. For many it is a favourite place to hang out and watch the world go by. And so in the fading light of evening we too sat there awhile to regain our energies before deciding at which ristorante we would enjoy our last dinner in Rome. Our three days in Rome were for us a history tutorial, a cultural tour and an adventure in Italian dining. What incredible sights Rome has to offer. We had viewed some of its ancient monuments, bathed in the glory of its religious heritage and learned about its famous artists and sculptors. In this delightful city, there’ll always be more to discover. All photographs by David Grimble.